Migration paths computed by PhyloGeographer are theoretical, based on a set of inputs from YFull and ancient samples which are not uniformly sampled across the world. The algorithm is a good faith attempt to derive an objective path, according to a Methodology, and may not always compute a path that makes sense, depending on the complexity of the distribution. Each month the paths are updated based on latest YFull samples. I hope you find this free resource useful for your own research. N-L1025, whose ancestors came from Finland (possibly via Stockholm) experienced a major diversification event in 600 BC by founding six lineages. They stretch from the northern coasts of Sweden and Finland to Poland. 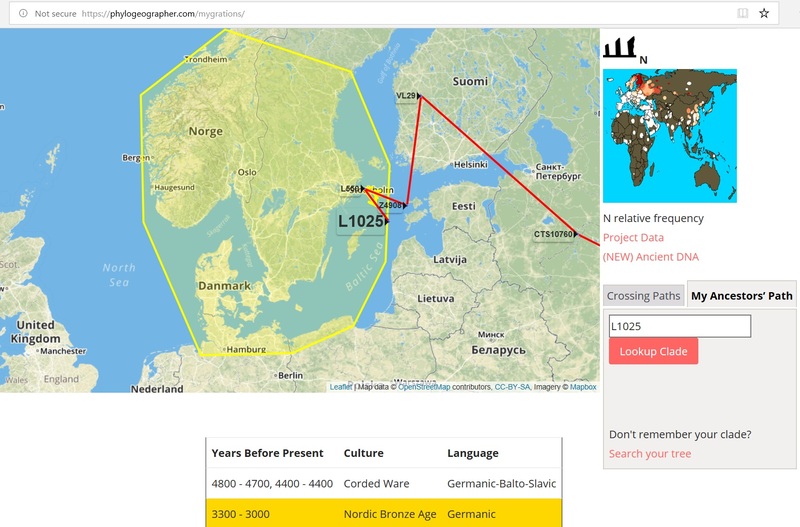 South Baltic L1025 - Note Z16981 likely also formed in Latvia or Lithuania and the algorithm should be corrected to not be pulled west by English and Dutch samples. The greatest diversity appears in Latvia and Lithuania, which may be a clue to where this man was born or lived most of his life. The area of greatest diversity of L1025 subclades seems to match the West Baltic Culture of Cairns. The migrations of L1025 may have been checked in Poland by the Pomeranian Culture, which itself was expanding southward at the same time. Subsequent migrations to the south and east might be explained by lineages having been assimilated into Slavic groups. However, one interesting migration from the Baltic to the Poland/Slovakian border dates back to 200 BC. Around the same time or a few centures earlier, a likely Celtic lineage in haplogroup J-CTS11760 migrated to the same area from the south. Perhaps Y6077's migration to this region is representative of the expansion of the Przeworsk Culture, an amalgam of local cultures with Jastorf and La Tene influences that probably also comprised the Vandals. "According to the Gallaecian Christian priest, historian and theologian Paulus Orosius, the Vandals, who lived originally in Scoringa, near Stockholm, Sweden, were of the same stock as the Suiones ("Swedes") and the Goths." - Wikipedia "Vandals"
I mention this purely as interesting anecdotal evidence which cannot be taken as proof. 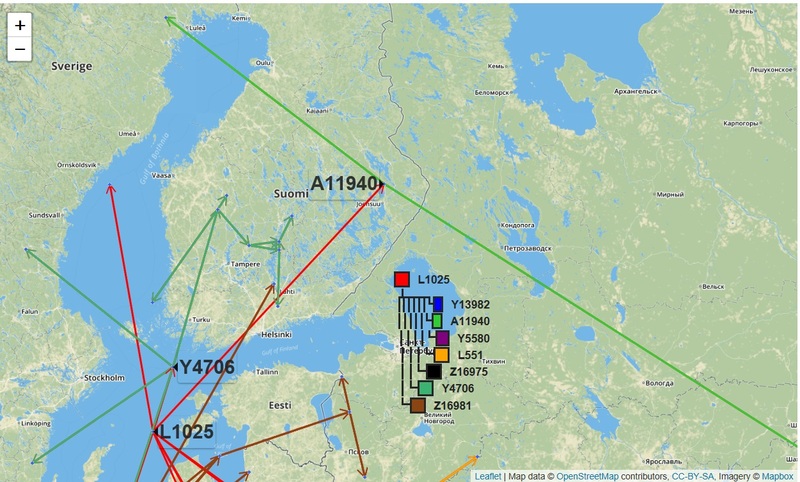 The ancestors of Y6077 do appear to have lived in Stockholm in 900 BC (below migration of L1025), but this is about a millennium before the Vandals become known to history. Given the deep diversity in Latvia and Lithuania between 600 BC and 200 BC it seems likely that the previously Finnic ancestors of Y6077 may have assumed a Baltic cultural identity during this time. This lineage may have joined a coalition of diverse tribes in neighboring Poland that ultimately became known as Przeworsk. 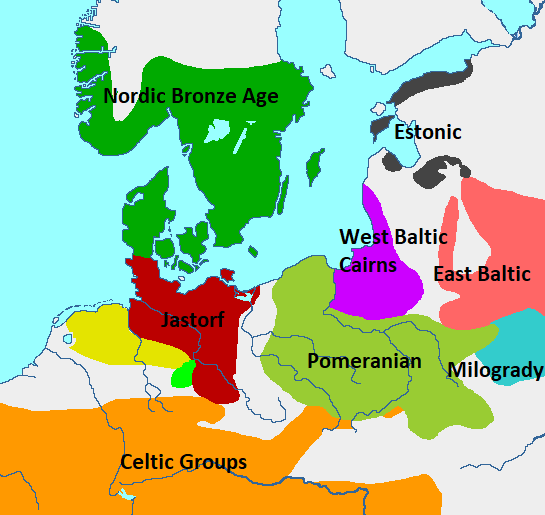 Early historians from Greece or Rome would have likely lacked the knowledge to distinguish these tribes from one another on a cultural basis, so unless it can be proven unlikely on the basis of material finds, it makes sense that some Baltic or Finnic tribes could have been lumped together as "Germans" by these ancient chroniclers. The L1025 man who lived at the end of the bottleneck in 600 BC was likely a powerful tribal leader who either was born or spent most of his life in Latvia/Lithuania. He was engaged in enterprises, expeditions or had his sons marry into families from Poland to Finland and northern Sweden. His ancestors likely had been living in Finland since at least 1600 BC and may have become integrated into and/or conquered peoples living in Stockholm around 900 BC.